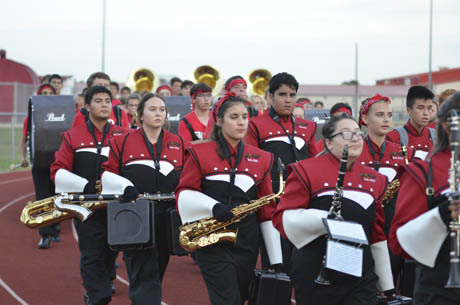 Salado Eagles scored three touchdowns in the first 13 minutes of their District nod with Connally Cadets and then had to hold on to win 40-35 improving to 3-2 and 1-0 in district. Rustin Hale fell on a snap that went over the head of Connally quarterback Gaylon Glynn, giving the Eagles the ball at the Cadet 17 yard line. Eagles Marching Band were in full uniform and performed their halftime show. Three plays later Hunter Turk dove in from the 3 yard line. Wrook Brown’s kick gave the Eagles a 7-0 lead. Connally took the ensuing kick off and drove to the Salado 13 yard line where an incomplete pass on fourth and four turned the ball over to the Eagles with 8:31 left in the first. The Eagles took six running plays to drive 87 yard. Connor Cook bulled in from the 3 yard line with 6:18 left in the first. He also had a 52 yard run on the drive. Brown converted the PAT for a 14-0 lead. Connally got to near midfield and stalled for a punt, burying the Eagles at their own 9 yard line. Eight plays later, Salado scored on a 14 yard line on a run by Hunter Turk. The PAT gave the Eagles a healthy 21-0 lead with 11:16 left in the first half. The Cadets found the end-zone on the next possession, driving 65 yards on 11 plays. Workhorse running back Jay’Veon Sunday scored on a 4 yard run. The PAT made it 21-7. Salado answered with a sustained drive of six running plays. Turks scored on a 10 yard run on third down. Brown’s kick was good for a 28-7 lead with 4:12 left in the first. Connally scored with 1:25 left in the half, capping a 62 yard, eight play drive with a 10 yard TD run by Sunday. The PAT cut the lead to 28-14. The Eagles answered immediately when speedster Wrook Brown took the ball and blistered the Cadet secondary for a 54 yard touchdown with 37 seconds left in the half. The PAT failed and the Eagles led 34-14 going to the lockers. When the Eagles scored on the opening drive of the second half, it would be their last touchdown of the night. Salado drove 51 yards on seven plays. Brown scored on a 24 yard run with 8:19 left int he third. The PAT failed for a 40-14 lead. Connally answered on the next possession, driving 59 yards. Most of it came on a 44 yard pass from Glynn to Korie Black to set p a 2 yard dive by Sunday. The kick was good and Connally trailed 40-21 with 6:57 left in the third. Connally took advantage of a fumble Cook after a long run, driving 59 yards in 5 minutes to score on a 9 yard run by Sunday with 58 seconds left in the third. The PAT narrowed the lead to 40-28. Devin Pullin fell on an on-sides kick for Connally to give the Cadets the ball at midfield. Flynn hit Black in stride for a 49 yard touchdown and Connally was within one score of the Eagles, 40-35 with 45 seconds left in the third. Kavian Taylor intercepted Hutton Haire;’s only pass attempt of the night to give Connally the ball at the Connally 36 yard line. Nine plays later, Glynn missed his target on a fourth and 10 turning the ball over with 7 minutes left to play. The Eagles used ball control taking over at their own 32 yard line. Twelve plays later Haire knelt for the final at the Cadet 15, giving Salado the win.